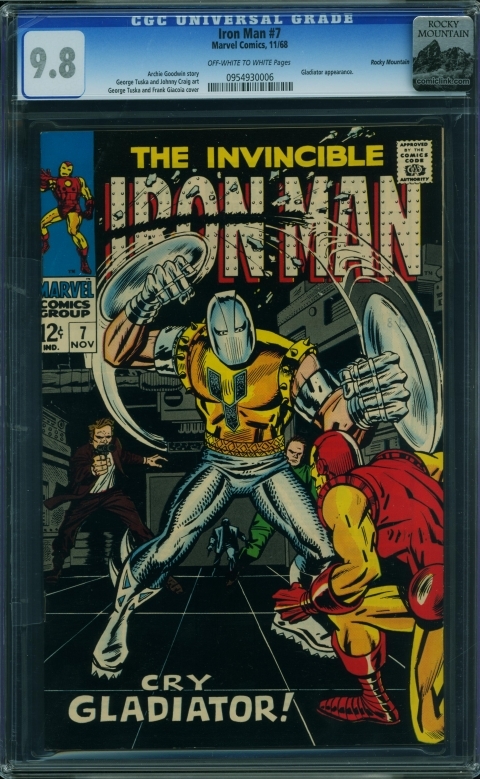 The comic book portion of the ComicLink Fall Featured Auction ended Thursday December 8th. I’m really enjoying these CLINK auctions. The selection is great from every era! Tops of keys, tons of high grade, tons of unique stuff we don’t see every day, it’s like these guys know what they’re doing or something. The two big hitters were the CGC 9.4 OW/W Tales to Astonish #27 that took top spot selling at $205,501 and the CGC 9.4 OW/W Journey into Mystery #83 that came in second selling at $195,000. I’ll take the Tales 27 any day of the week! 6 restored books with loud in your face old style Purple CGC labels, is this the beginning of the end of Purple being the color value turn to to die? Iron Man #7, Marvel Comics, November 1968 Graded by CGC at 9.8 with Off White to White pages sold for $7,500.00. 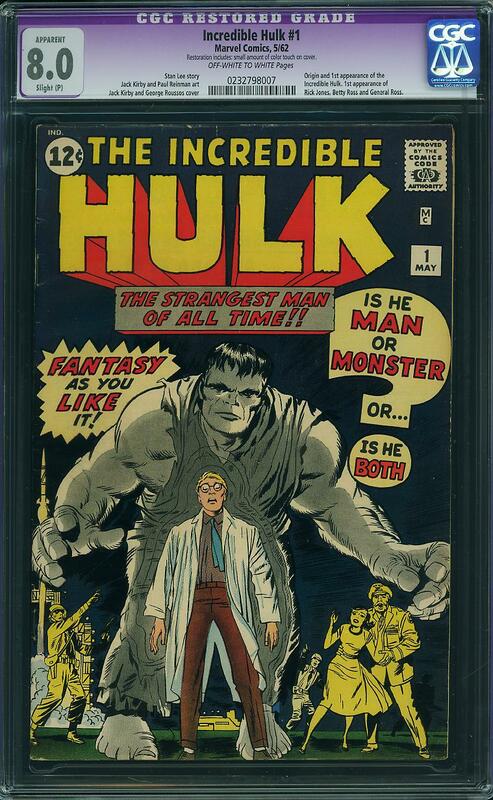 Incredible Hulk #1, Marvel Comics, May 1962 Graded by CGC at 8.0 Restored with Off White to White pages sold for $16,605.00. I have a CBCS 8.5 Restored for sale in the ICE site so I was looking for this result. At first I went “YAY, mine has a chance to sell” then I read the restoration notes on the label – Slight (Professional), with small amount of color touch on cover – . So someone wants to un-resto this book, send it down to some mad scientist paper guy and scrape off the added color that is on the cover. 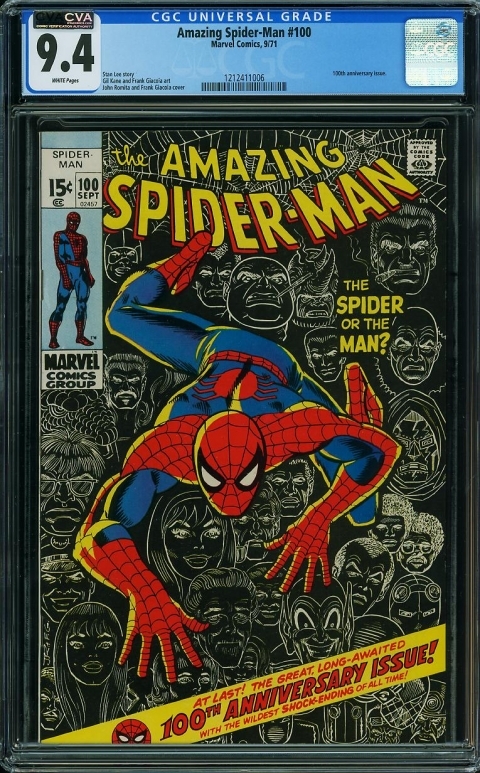 This must be the case because extensive resto for this book at this grade or higher sell from $7k to $9k. On paper this is a good plan. On this same auction a Hulk #1 5.0 got close to $14,000 so this book will need to come back at least a 6.0 unrestored for this exercise to work – factoring in all the extra costs to get it to Blue Label. Risky game and I’m not sure the owner of the book has any obligation to say whether he or she have already unsuccessfully tried this. 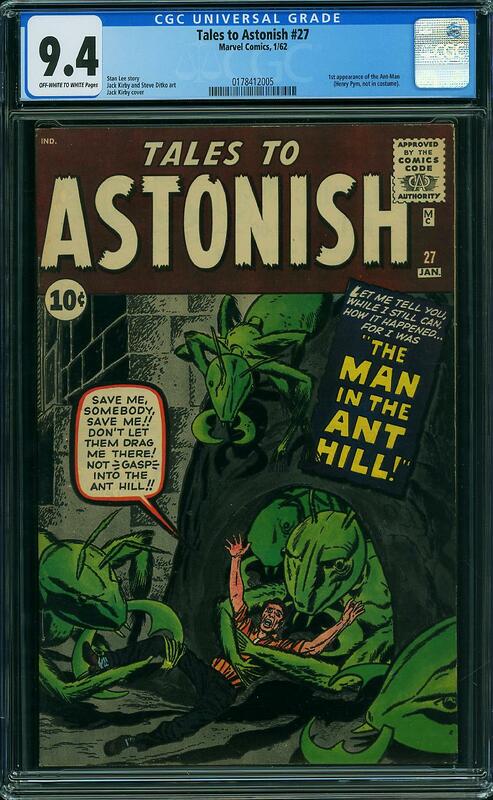 Robin Hood #1, Anglo American, March 1941 Graded by ComicLink at roughly a 3.0 sold for $3,399.00. I’m happy to say I won this auction. There was a lot of excitement about this book coming to auction. I believe it’s the 1st one ever to make an auction and it is the 1st one I’ve ever seen and I’ve been hunting Canadian Whites for years. 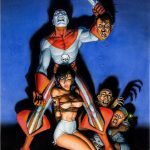 I think the sale amount is disappointing and I think a lot of it has to do with the lack of a CGC case. Oversized raw books are tough to mix in with everything else. Still, looking at the results the Robin Hood #2 and #3 got and the strong results for Three Aces #1 and #2 it’s hard to argue against this book selling cheap. Robin Hood #1 and Better Comics #1 from Maple Leaf Publishing share the honors of co-launching the Canadian Whites era back in Mach 1941. I’m excited about having a copy of each. Amazing Spider-Man #100, Marvel Comics, September 1971 Graded by CGC at 9.4 with White pages sold for $405.00. 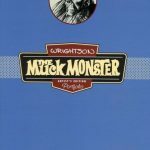 If I could ever give a seminar or a tutorial on how to buy graded comics I’d bring this copy into the classroom with me. Have a look at this thing, it is jaw dropping in its technical near perfection. The Color Strike is vivid and bold, there are no arrival dates that I can see, the binding is at the absolute sweet spot, all you see is that 1/32 of an inch of white along the spine that does not deviant at all meaning that it’s as perfectly bound as any copy of this book I’ve ever seen and meaning that its printed at a true 90 degree square. And hey, it has White pages. I bid on this book and as I’m typing all this out I’m mad I didn’t go higher. Boy Comics #3, Lev Gleason, April 1942 Graded by CGC at 9.0 with Cream to Off White pages sold for $2,311.00. I bid on this book too but chickened out way too early. This is a high grade Golden Age Key, it is the 1st issue of the run featuring the 1st appearances of Crimebuster and Iron Jaw. I think Golden Age keys like this one stand to gain lots of ground over the coming years, just compare this price to what we’re paying on Silver/Bronze and Moderns. So? You pick up anything? I’ve tried unrestoring books before and have been successful a couple of times, while other times the restoration could not be undone. However, the purchase price was so cheap, I was able to get my money back. 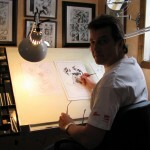 The last Hulk #1, 5.0 sold for $15500 and a 6.0 sold for $22000. I can’t imagine a purple 8.0 going below 5.0 for scrapping some ink off but if the restoration can’t be undone, $16600 is a hefty price tag. Congratulations on your acquisition of Robin Hood # 1 Walter! I imagine you are as excited about winning that rarity as much as I was when I won the Canadian Victory pulp. It has certainly found a good home with you! 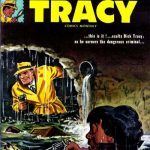 Is Detective #327 still undervalued? The 9.6 sold in this auction on 7 December for $1.4k. I just checked GPA and it shows a 9.4 selling for $3k on 8 December. Let’s just say I hope that $3k sale is real. If so, I owe Walter a nice dinner. There were some good books for sale in that auction. Sometimes you guys totally freak me out. I love this medium, but $K are not in my vocabulary. I guess I should envy you, but bandying about numbers like that just kind of alienates me from my favourite pass-time. Nonetheless, congratulations to the lucky folks who filled their want lists. Sorry Mel – I’d hate to alienate anyone from the greatest hobby in the world. The reason for the $k (or $mm in the case of Action #1 and Detective #27) is what brings us together, which is love of the medium. I read comics when they were 15 cents, and I still read them at cover price (or less!). 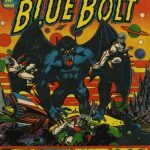 I also find the investment angle interesting, hence my post, but I know that there would be no investment value if it weren’t for the many years of priceless enjoyment that comics have brought and continue to bring. Hey, I just looked up that Hooded Menace, fantastic pick up – such a cool book. I’m like Red Buttons – never got a dinner! 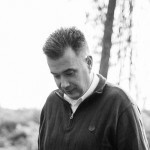 Thanks Tony – I can’t wait to get it – I’m hoping Ivan will help out and we can get good images of each page. The recent December 6,7,& 8th 2016 comic link results were surprizing. 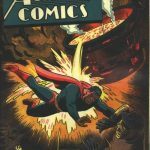 As the US stock market soars, to record levels, rare collectable comics fall through the cracks! 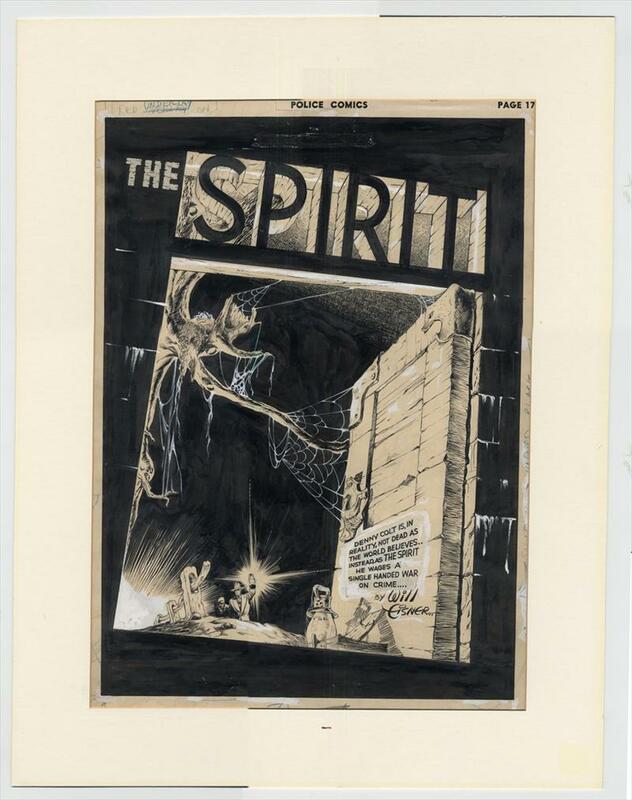 Star Wars 42 in unbelievable 9.9, by famed artist Al Williamson, after 75 bids failed in break $6,600, so this 36 year old book from 1980 representing the first Yoda was the bargain result of the week! The book is unimaginable perfection encapulated! A second bargain price was for 1935 81 year old Toronto Telegram Robin Hood Charles Snelgrove dailies reprinted in Robin Hood 1, just 6 years after their original 1935 prining, and 1939 color reprining in europe. A true steal at $3,399 for a 3.0. This is the only surviving known copy of this issue of the 1941 reprint. 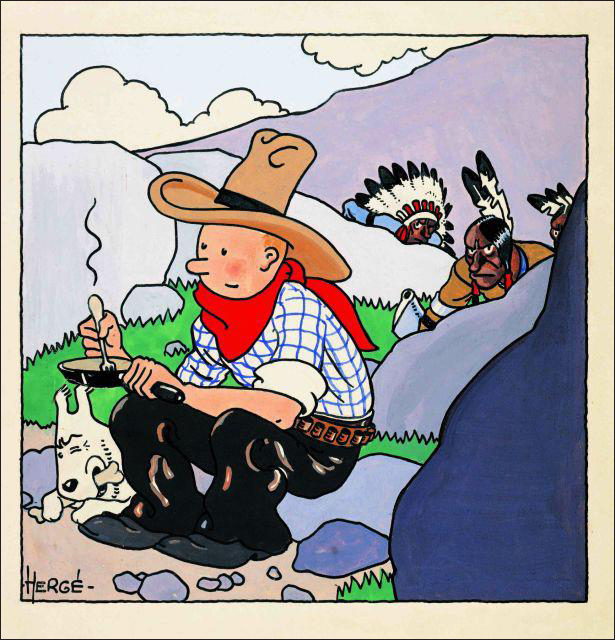 Compare this to the no number Nelvana 1945 compliation the sold for $14,750 last year in 5.0. It is true that Nelvana is a Canadian creation and highly inspired super heroine, Robin Hood is arguably a recycled newspspaper strip filler that is tecnically lacking a cover, printed in one color, and lacking any Canada content relevance. It is not a comic book in size or format. 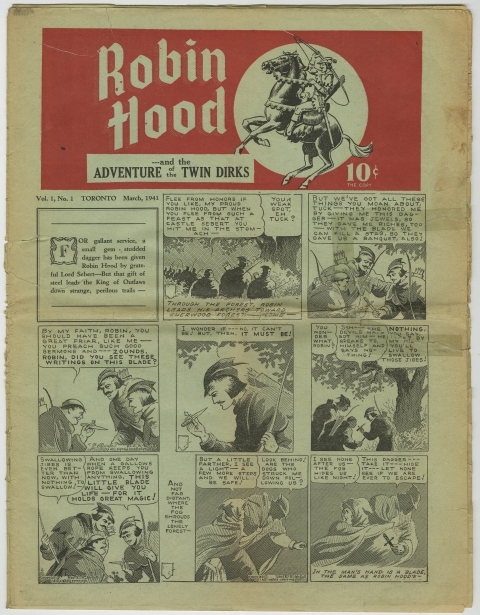 But i ask…..is an iconic cover such as Nelvana’s nn 1945 really worth 4x that of the Robin Hood newspaper reprint.??? Not to the one Robin Hood completist seeking the only known CGCed copies of issues 1, 2, 3, and 5. Well, not to worry too, too much. I started reading these babies when they were ten cents, and, at 62 have no real intention of quitting. I am just constantly amazed at some of the prices realized for them now, which have pretty much frozen me out of my personal nostalgia choices. The beautiful thing about this medium is its durability and flexibility. At no time in the history of the medium have there been so many permutations of what a comic book could be. I guess I should just avoid reading the auction reports and just dive back into what I already have. Investment schminvestment. 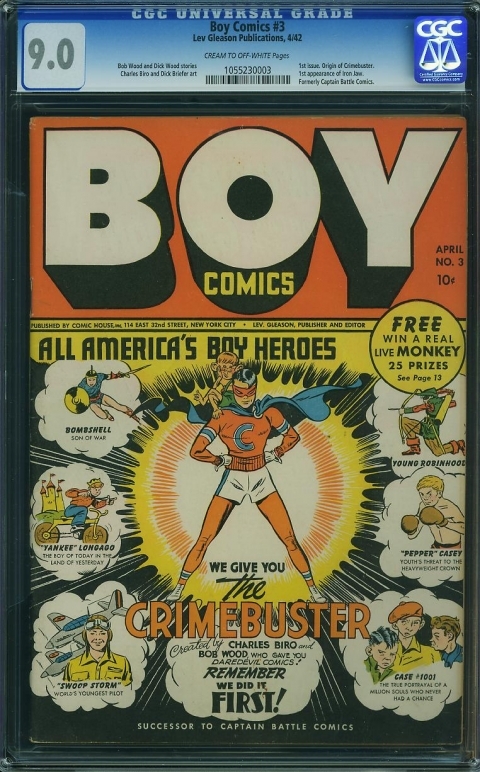 Did any one claim the free live monkey prize on Boy Comics # 3 ? That’s what makes this book interesting. Amazing actually is if it truly occurred. Gives new angle to Collecting Gorilla /Ape/Primate covers.